CHRIS ALGIERI (22-3 8KO’s) returned to the Star Boxing’s acclaimed venue, The Paramount in Huntington, NY for the first time in over four years as the former WBO Super Lightweight champion looked spectacular in dismantling a game and rugged ANGEL HERNANDEZ (14-12-2 9KO’s) from McAllen, TX over the 10 round distance of a Jr Welterweight contest in the main event of Joe DeGuardia’s Star Boxing Rockin Fights 33 before a frenzied sold-out standing room only crowd last night. 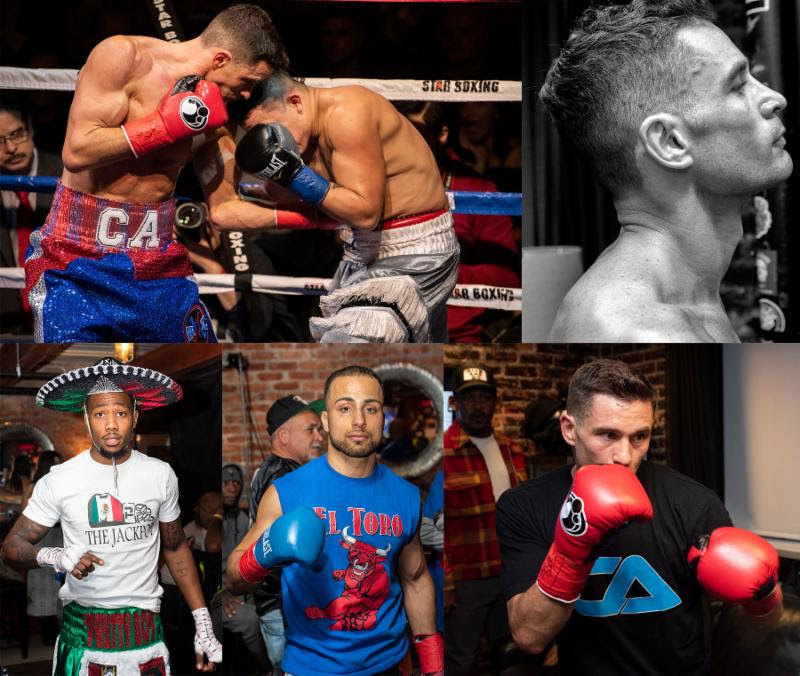 Algieri took control from the outset as he displayed the superb boxing skills he is known for but under new head trainer Andre Rozier, Chris has added another dimension to his already potent offense. Chris worked at a very high rate and threw numerous impressive multi punch combinations to both the body and head of Hernandez. Algieri displayed tremendous hand speed and his usual impeccable conditioning. Hernandez for his part tried the best he could and moved forward the entire fast paced fight but was no match in skills of the former world champion and in the end Algieri came away with the unanimous decision, 100-90, 100-90, and 99-91 improving to 22-3 8KO’s while Hernandez dropped to 14-12-2 9KO’s. The semi-final 8 round Welterweight bout pitted Elmont’s TYRONE “PRETTY BOY” JAMES (9-0 6KO’s) and LEONARDO CARRIZALES (5-6-1 2KO’s), Tampico, MX. They certainly didn’t disappoint the sold out crowd as they put on a wild bout which saw James score a sensational 8th round TKO after a series of eye opening uppercuts. James started out boxing beautifully over the first 5 rounds landing vicious shots to the ever charging Carriales who also landed his fair share of blows. In the 6th round the fight took a dramatic turn as Carrizales landed a blistering right hand to the jaw of James dropping “Pretty Boy” for the first time in his career. James arose on very wobbly legs but hung in there to finish the round. The final 2 rounds saw wild action between these two fighters as they stood toe to toe trading bombs with each other, much to the delight of the crowd. The end came as James cornered Carrizales and landed 5 straight vicious uppercuts which had Carrizales’ head moving like a Jack N Box and forcing the ref to call a halt to the bout at the 42 second mark of the final frame. James improves to 9-0 6KO’s while Carrizales drops to 5-6-1 2KO’s. Undefeated Lightweights OMAR BORDOY (7-0 2KO’s) and TEREL BOSTIC (3-1 1KO), put on a fight to remember over the 6 round distance. Danbury, CT’s Bordoy took the fight right to the local Wynadanch fighter, Bostic, as they went back and forth in a high paced, skillful match. Bordoy dropped Bostic with a monstrous right hand in the 3rd round and tried his best to finish Bostic but was unable to do so. Bostic came out for round 4 and took the fight right to Bordoy getting the best of the action. The final 2 rounds had the crowd going wild as the 2 young fighters traded freely and in the end Bordoy came away with a split decision winning 58-55 on two card while Bostic prevailed on the 3rd card 57-56. ALEX VARGAS (2-0) won a hard fout 4 round decision over Rochester’s JARRILL HAADI (0-1), getting off the deck in the first round to do so by scores of 38-37 across the board and Jr. Welterweight DASHAUN JOHNS made his pro debut a successful one taking out late sub DEVON GRANT in the first round. Promoter JOE DEGUARDIA had this to say about the fights: “What a spectacular night of fights. The Paramount was electric and Chris Algieri confirmed that he wants to regain his world championship belt. We plan on providing Chris with another world title opportunity in 2019.